Computer simulation played a critical role in understanding and solving a problem with microscopic bubbles in a revolutionary switch used to switch optical signals in fiber-optic circuits. The Agilent Photonic Switching Platform operates by blowing bubbles in just the right spots in a tiny trench cut in a planar lightwave circuit. The bubbles redirect light beams into different paths in order to reconfigure fiber-optic networks. Early prototypes showed performance problems that indicated the something was unstable with the bubble reflection. But the small size of the bubbles made it impossible to make the comprehensive physical measurements that would be needed to diagnose and solve the problem. Fiber-optic cable has provided dramatic increases in data communications throughput, and there has been a big desire to be able to switch large volumes of fiber optic data without turning the optical signals into electrical signals for switching and then back to optical signals. In the mid-1990’s, Agilent Laboratories (when it was part of Hewlett-Packard Labs) realized the importance of an all-optical circuit switch and started a research program to develop such a technology. A team of engineers and scientists was formed within what is now Agilent Labs’ Communications and Optical Research Laboratory (CORL) to develop this unique switch fabric, which is compact, scalable, and has minimal impact on the optical signal. The team capitalized on two very established technologies – inkjets and planar lightwave circuits — to build a switch that routes an optical beam from one path to another without having to convert the switching signal from optical to electronic and back. Simulation helped us determine exactly what was causing the dimple and helped us to identify and evaluate several alternative solutions. This progress in bubble switch engineering would not have been possible without the advanced modeling features available in the FLOW-3D software. Just as important for us was the knowledge and integrity demonstrated by the Flow Science team from the start of the project. While the other software companies that we talked to had sales reps with only a surface understanding of the issues involved, Flow Science engaged technical staff with the expertise to understand exactly what we wanted to accomplish. At several stages of the process, they provided critical help that allowed us overcome significant obstacles. In order to work, the Agilent Photonic Switching Platform is placed at the intersection of two fiber-optic networks (Figure 1). When a light signal comes in through a fiber, it can cross the planar lightwave circuit unimpeded via the straight through wave-guide. However, if the signal must be redirected to a different optical fiber, inkjet technology inserts a bubble into the cross point of the two wave-guide paths, altering its optical properties and reflecting the signal down the path to the output fiber. The bubbles can be formed and removed in less than five milliseconds, all without the use of mirrors or mechanical moving parts. This switch operates by blowing bubbles in a fluid that is index-matched to the array of crossed optical wave-guides. The bubbles are formed by evaporation induced by electrical heaters on the device substrate. The fluid fills an array of micro-trenches located at the cross points of the waveguides. Total internal reflection from the bubble wall causes light to be switched from one waveguide to another. The problem is that the acceptance angle, or numerical aperture, of the optical waveguides is fairly low. If the vertical reflecting wall of the bubble is not perpendicular to the axis of the waveguide, the light will not be properly reflected into the output wave-guide and there will be signal loss. Extensive experimental testing was performed on early prototypes, showing the effects of heater power and ambient pressure on the optical reflection characteristics and on the bubble shape and size. These tests showed that the reflected optical signal vs. heater power curve not did not meet the tight requirements needed for effective optical switching and that there were instabilities in the reflected light signals. 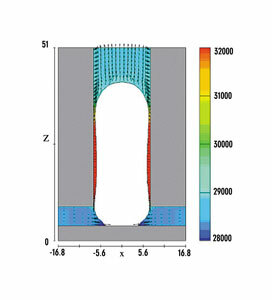 Figure 2: Flow and form simulation with FLOW-3D. Pressure in pascals and distance in mm. When the computer simulations showed that there were dimples forming on each side of the bubble as shown in Figure 2, it dawned on the Agilent research team that the dimples might be what caused the humps on the power curve and why the reflected signal was so unstable. 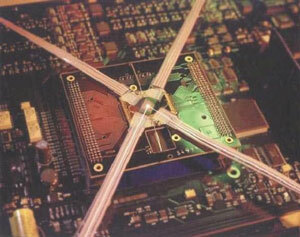 The team’s ability to take physical measurements with sensors did not extend to the scale of the MEMS device. The most they could do was use special optics to take photomicrographs. These pictures could not show the dimple directly, because the dimple is very thin on a wavelength scale. Flow Science’s new homogeneous bubble model assumes a uniform bubble pressure and temperature. This is a good approximation to reality. One of the key issues is the modeling of the contact line, where the liquid, vapor and solid all come together. The homogenous bubble model balances the forces and fluxes in the computational cell at this point. Uebbing started out using the older version of the software, but as soon as the new model was released, Uebbing tried it on the problem at hand. “The simulation results showed the dimples that were eventually to prove so important in explaining the experiments,” Uebbing said. “Just as interestingly, the simulation showed that the bubble oscillated at 35 kHz. We had taken experimental data that showed it really did oscillate at that frequency, but we had no idea why. The simulation showed that it was just a simple spring mass or a trenched version of the classic bubble radial oscillation. Understanding how the dimples were formed suggested two methods of correcting the shape of the bubbles in order to provide stable signals. The first is to extend the bubble heater under the glass sidewall of the trench. Heat then flows up the wall of the micro-trench and dries out its surface. Simulations with FLOW-3D show that dry wall bubbles give very stable switched signals. Basic physics suggests that if the bubble temperature is less than the wall temperature the wall will be dry. This expectation was confirmed with FLOW-3D simulations. The second method, also verified with FLOW-3D, is to make a so-called static bubble in the micro-trench. Static bubbles exist if the device temperature is somewhat hotter than the pressure setting reservoir temperature. This device temperature creates enough pressure to push the bubble into the corners of the trench, but not enough for the bubble to blow out through the gap between the waveguide array and the heater substrate. These static bubbles can be turned off with a nearby “crusher” bubble. This bubble temporarily generates enough overpressure to cause the static bubble to collapse. The crusher bubble itself is in a smaller trench so that surface tension forces are enough to make it collapse after it has done its work. FLOW-3D simulations were also used to show the switch operation in this mode.